Over two centuries ago, social theorist Thorstein Veblen commented on the way in which Victorian society’s elite set new fashions. These styles “trickled down”, with, as Lou Taylor explains, each “social rank emulating the one above it.” My how times change in the ephemeral world of fashion. In the first major retrospective to cover his career- The Fashion World of Jean Paul Gaultier: From the Sidewalk to the Catwalk- Gaultier unpicks Venblen’s theory, revelling in unravelling pecuniary emulation. Rather than a taste for couture reflecting one’s social ‘distinction’, to peacock in Gaultier’s couture is to demonstrate that one is entirely street savvy. Denim muille fuille pleats are finished along their creases with perfectly-placed, pinhead-sized Swarovski crystals; a tulle gown from the Romantic India Collection S/S 2000 took 312 hours to ruffle into a camoflage pattern. Gaultier is calculated and crafty when he re-appropriates the habitus of subcultural style into haute couture luxuriousness with links to counter culture. 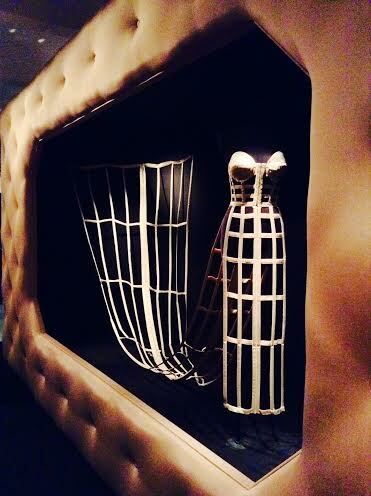 Hands down, Gaultier is the master of ‘trickle-up’. Does Gaultier confuse Bourdieu with his redissemination of design? He most certainly does not confuse the Barbican. The multi-arts venue’s gallery is, fittingly, a slightly irreverent space. Multi-layered, its brutalism is complicit in concocting fresh views from new angles. It is a bricked mini-city that compartmentalises the show’s six themes as tightly as Madonna’s cone bra corset, whilst mixing media as fluidly as Gaultier’s androgynous models blend genders. Talking mannequins, illustrations, objects (a Spitting Image puppet, Gaultier stamped Ben Hur chairs), accessories (Stephen Jones’ weeping fezzes), video ("Eurotrash" and "Absolutely Fabulous") and photography (featuring Nirvana’s gaunt Kurt Cobain in black sequins) all add virility to the quirky, vamp-camp collection of nearly 160 pieces. How refreshing to have a fashion designer not take himself too seriously. Except, of course, that’s all a rue. Gaultier’s 35 year career didn’t happen by accident. Having lost his job as Creative Director of Dior to Galliano (oh, how the tables have turned), Gaultier (who showed his debut collection in 1976) opened his first Parisian boutique (having worked for the likes of Pierre Cardin and Patou) in 1985. Being the eighth venue on this exhibition’s tour (conceived by the Montreal Museum of Fine Arts in 2011), one would have thought he’d be at ease with the making of the show by now. 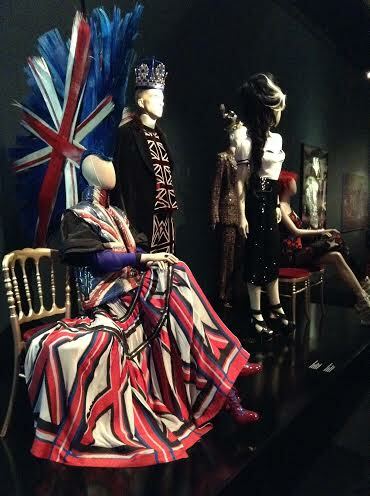 But apparently not- on the Costume Society UK’s guided tour of the exhibition Wednesday 4 June, 2014, the assistant curator exposed Gaultier to have been nervous about exhibiting in London (though his press releases reported otherwise). Indeed, just a week before the exhibition was due to open, he stripped the mannequins and rearranged the installation (#curatorialnervousbreakdown). The show’s one disappointment? The numerous collaborations that passed unacknowledged. “Punk Cancan” failed to mention Gaultier was working with Ray Petrie and the Buffalo Collective (whose photography revolutionised fashion editorials in the Face and i-D Magazine), and that he still works with French photographer Jean Baptiste Mondido, also a member of the collective. 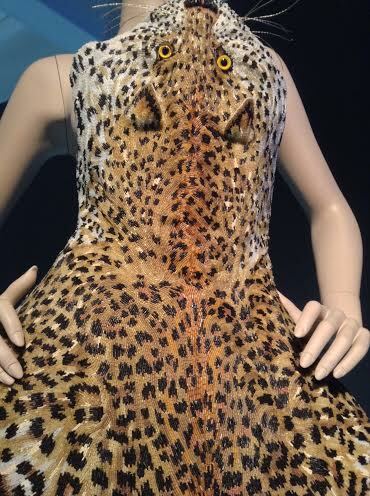 Similarly, a gown that took 1060 hours to construct, featuring a leopard skin with rhinestone claws embroidered entirely out of swirling beads, failed to mention it was the work of Lesage! 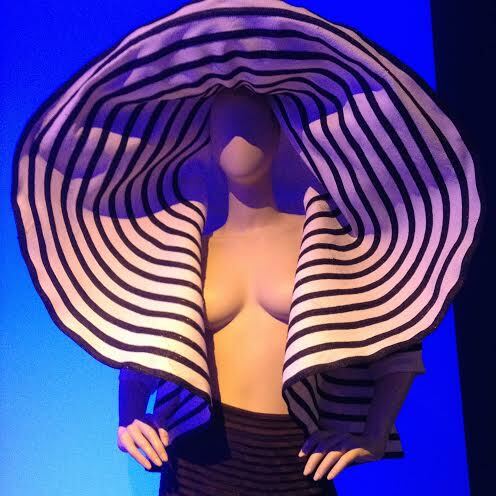 "The Fashion World of Jean Paul Gaultier: From the Sidewalk to the Catwalk" showcased all the designer’s signatures: the Breton stripes, the conical bra, the apricot-ish pink, men’s skirts, Virgins, mermaids, tattoos, punks and Paris. His is an upside down world of haute couture that challenges not only the viewer’s notions of designer exclusivity, but also, the constructs of the luxury fashion industry at large. Like the title of his remixed 1988 dance hit, Jean Paul Gaultier knows “Aow Tou Dou Zat”- with a touch of postmodern punk, an historically informed clench of the corset and a suggestive wink in the direction of the boudoir.